In my last article I discussed my opinions on the top 6-10 items on my top ten list of cards from Invasion Earth. Since then I'm sure a lot of us have had the opportunity to become more accustomed to some of the cards in the set. Today though, I'll be covering some similar concepts as I did last week, but this time I'll be taking a look at numbers 1-5, completing the list in the process. Let's get started with number five! 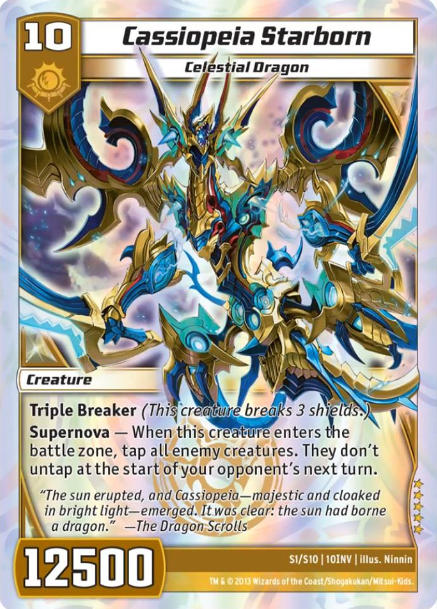 The Hype: This card is going to replace [ccProd]Squillace Scourge[/ccProd] in control decks! Cassiopeia is definitely a worthwhile card overall with its ability to tap down your opponent's entire board and keeping them tapped. This effect is quite devastating as a game-ending play. 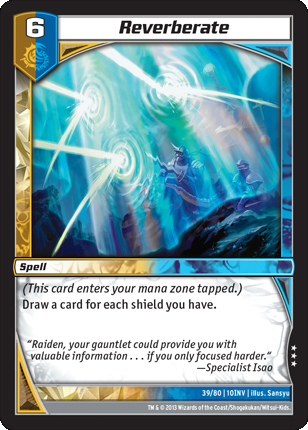 It essentially makes it so you can either swing over your opponent's creatures on the board or simply go in for shields without fear of your opponent revenge killing your guys. It definitely has an upside from [ccProd]Squillace Scourge[/ccProd] in the fact that it won't discard your hand and rid you of your resources that you've built up throughout the game. The area that this card pales in comparison to Squillace is that Starborn can't stop your opponent from throwing down a Fast Attacker to swing in for game. The Hope: This card will provide control and dragon players with a new finisher. Starborn will make an impact in these deck types, however, it's not the card that everyone will run three of in a deck. This will likely be a one or two of in a deck. Being a ten cost creature is fine if you're a Monarch and if you're gaining three to four abilities, but not so much if all you're going to do is tap down your opponent's board... they might not even have that many or even any creatures in some scenarios! The Hype: We just got another "hexproof" guy? What's the point of even running targeting spells anymore?! [ccProd]Tricky Turnip[/ccProd] is definitely a force to be reckoned with, sort of... Being a turn three for 3000 power is acceptable by most standards, but that's it. Turnip can't be dealt with by normal means such as [ccProd]Bone Blades[/ccProd] or even [ccProd]Terror Pit[/ccProd]. There's still plenty of alternative approaches out there that will easily fend off this vexing vegetable. 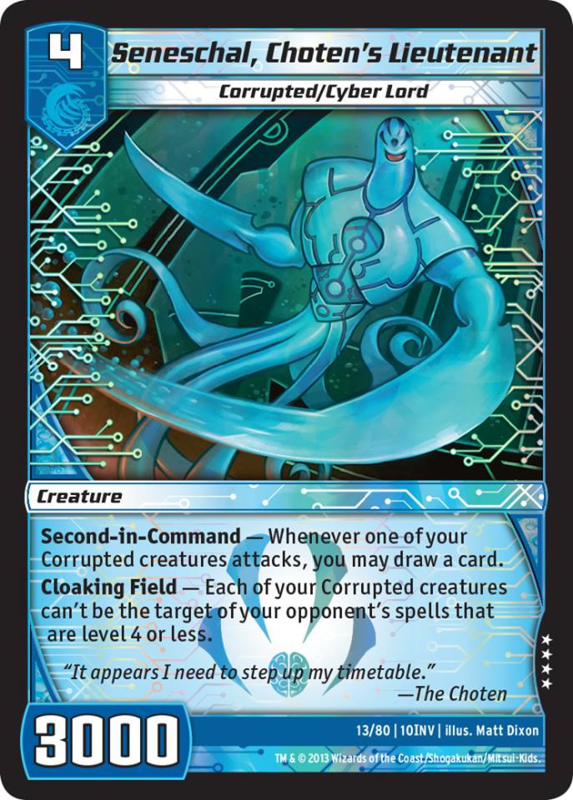 You could simply run bigger creatures than your opponent does or throw out some run-of-the-mill blockers like [ccProd]Aqua Strider[/ccProd], [ccProd] Fullmetal Lemon [/ccProd], or even [ccProd]Skeeter Swarmer[/ccProd]. Let's not forget about cards that don't target your opponent's creatures either. Cards like [ccProd] Tendril Grasp [/ccProd]and [ccProd]Vile Malvictus[/ccProd] make quick work of Turnip as well as a lot of his comrades. The Hope: This card will increase the playability of Wild Veggies. Currently we don't have a ton of support for the Wild Veggie archetype. 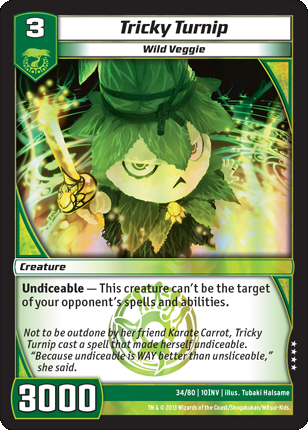 With the release of Invasion Earth, we gained access to a couple of really powerful cards in the form of [ccProd]Bad Apple[/ccProd] and [ccProd]Tricky Turnip[/ccProd]. When these two cards are used in combination with one another you can turn every one of your Wild Veggies into a[ccProd]Razorhide[/ccProd]. There's the potential in the future for these guys and of course, plenty of room to grow. The Hype: I'm going to draw 5-7 cards when I play this card every time! Everyone will be running 3 of this card! [ccProd]Reverberate [/ccProd]opens up a whole new can of worms for the game. It allows you to draw for each shield that you happen to have at the time you play this spell. Realistically you will get between 2-5 cards off of this card when you play it and that's what makes it, in my opinion, the best draw spell in the game. In most cases, you don't really want to drop this card if you're at 10 or more shields unless you feel like decking out within the next turn or two. This card really shines when you have between 4-7 shields and you barely have a hand to work with. Imagine ramping up in a deck or discarding cards from your opponent's hand, or even using all of your cards to banish your opponent's creatures... and then play this card. This card can and will single-handedly change the momentum of a game if it's cast on turn six... it's almost like a[ccProd] King Tritonus[/ccProd] without the body, almost. The Hope: [ccProd]Reverberate [/ccProd]will give players a way to come back from all of the discard cards out there and make a comeback. If you've ever played against a deck that likes to discard your hand, you know that it can be rather frustrating at times. Being forced to either put a card in mana, play it, or lose it, are not the options that most people like to have in a game that involves strategy and planning out one's moves. With[ccProd] Reverberate [/ccProd], that all changes. If you happen to topdeck this card, all of your opponent's work to keep you down to zero cards has just been undone and you're back in the game! This card also opens up new strategies for Dragon users out there. Some people started gravitating toward Water/Fire/Light Dragons using [ccProd]Logos Scan[/ccProd], add in a [ccProd] Reverberate [/ccProd]or two and your options just increased exponentially. The Hype: All of my creatures are going to turn into[ccProd] General Finbarr[/ccProd] and gain a "Semi-Hexproof" ability! The above statement is actually true but there are many ways around that strategy. [ccProd]Seneschal's Lieutenant[/ccProd] is a very powerful creature at level 4 mainly because it gives your other corrupted creatures protection from the most commonly played spells used at the beginning of the game, like [ccProd]Bone Blades[/ccProd] or [ccProd] Piercing Judgment[/ccProd]. He also gives himself and all of your other Corrupted creatures the ability to draw a card when they attack, immediately replacing himself in terms of card value/advantage. Most Corrupted players will have a turn two and three play and will follow it up with Seneschal. In some cases they may have [ccProd]Bronze-Arm Renegade[/ccProd], which makes the decision to attack far less unnerving. Each time your creatures attack you're drawing a card and if you happen to hit a level 5 or higher shield blast that would banish one of them, they'll just go to the mana zone instead. If you play against Corrupted creatures, you'll need to find alternative methods of dealing with their creatures, otherwise the advantage their creatures will have over you will be astounding. The Hope: This will make the Corrupted deck become a viable option for players. 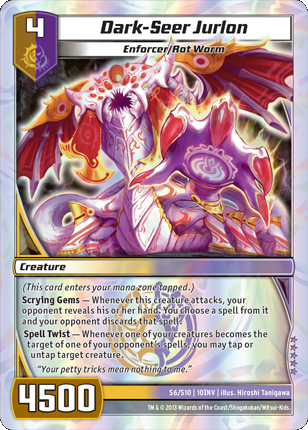 Corrupted decks are a brand new addition to the Kaijudo world with the introduction of the Invasion Earth set. For most decks out there, they require a very strong base to work outward from; [ccProd]Seneschal's Lieutenant[/ccProd] is that card. He offers the rest of your guys protection and draw power and with the aid of the other corrupted creatures, he has a near limitless potential depending on what cards you decide to add into your deck. The Hype: This card is going to make Water/Dark/Light Tempo so much more broken! Coming in at my number one pick is [ccProd]Dark-Seer Jurlon[/ccProd]. This card can easily break the control mirror in multiple ways. Jurlon can easily dispose of [ccProd]Keeper of Laws[/ccProd] with his respectable 4500 power for a level 4 creature. If you're worried about the spells your opponent is thinking about casting against you, all you have to do is attack and you can see your opponent's hand and potentially strip away a spell in the process! To make things even more extreme, Jurlon can tap or untap a target creature if it or another one of your creatures is targeted. Being able to swing in with a much larger creature with Double or Triple Breaker when you still have other creatures that can attack becomes a win condition in itself. If your opponent has a [ccProd] Terror Pit [/ccProd], [ccProd]Root Trap[/ccProd], or even a [ccProd] Bone Blades [/ccProd], they're either forced to play it, allowing you to untap your bigger creature, or they choose to not cast it, giving the other creatures the opportunity to continue on with their attacks. As a side note, this card can create some rediculous combos with [ccProd] Keeper of Laws [/ccProd] and even [ccProd] Twilight Commander [/ccProd] to the point where you will potentially have access to an infinite number of attacks. The Hope: This card will allow people to feel safer about playing their smaller creatures and Blockers on the board. Jurlon can protect you from being hit with a plethora of cards and can add some added protection if your opponent were to play [ccProd]Piercing Judgment[/ccProd]. Since two of your cards were likely targeted, you can tap or untap target creatures. So if your opponent tapped down your creature, you can untap it, and then you can tap down their creature to avoid them getting in an attack. This card will likely slow down the game state and will really get your opponent thinking of ways around the card, if they want to keep their creatures from being tapped at least. So there you have it everyone, my top ten card from Invasion Earth. There were quite a few cards that I would have like to have added to the list, but not every card can be so fortunate. Perhaps in an upcoming article I'll discuss some of the more underrated/tech choices that may see increased play in the future. Until next time everyone, this has been Mark Woodin, and as always, remember to keep calm and game on; see you all at the Winter Championships in Texas this weekend!